Whether you are designing, managing or building your network, you'll save time, money and effort when you turn to MaxCell. When you are planning your next network construction project, wouldn’t you like to be able to place 300% more cables and use 30% less manpower? Then MaxCell is the solution you need. 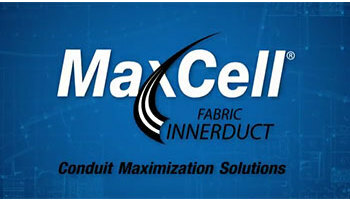 The unique fabric construction allows MaxCell to conform to the shape of the cables placed within, greatly reducing the wasted space of rigid innerduct. If you want to increase your productivity and boost your bottom line, MaxCell is the solution.